A blue pickup truck drives past Maria Ortiz Viruet as she walks down a paved road, followed by two small black dogs. The scene’s palm trees and mountains might lead viewers to believe nothing is out of the ordinary on this day in Puerto Rico. But Viruet, a public school teacher, has no students to teach, and her 18-year-old son is unable to finish his last semester of high school. Meanwhile, Aixa Jimenez, a home hospice nurse, struggles to care for her patients who require oxygen. Elsewhere on the island, Maria and Roberto Rivera keep their street food business open, seeking normalcy in the chaos. The storm, which made landfall on September 20, left the entire territory without power in what has become the largest blackout in United States history. Now, months after Hurricane Maria devastated the island, just 65 percent of Puerto Rico has seen electricity restored. And those estimates vary. What’s certain is that restoring power fully will take many more months. 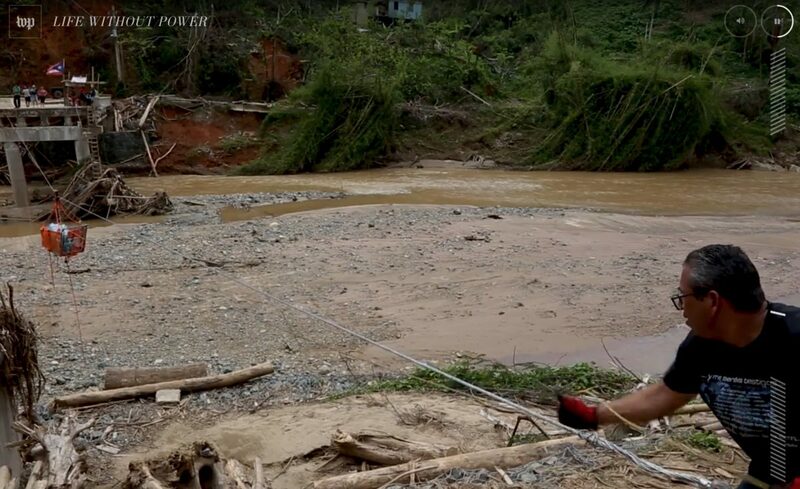 The Washington Post’s Arelis Hernández, Whitney Leaming and Zoeann Murphy traveled to Puerto Rico twice to explore Yabucoa, the town where Maria made landfall. Their work resulted in “Sin Luz: Life Without Power,” which was published in both English and Spanish on Dec. 14 without paywall restrictions. The project boasted a sixteen-person team that was responsible for reporting, designing and implementing strategies to display the videos, text and 3D maps in a full-screen experience. 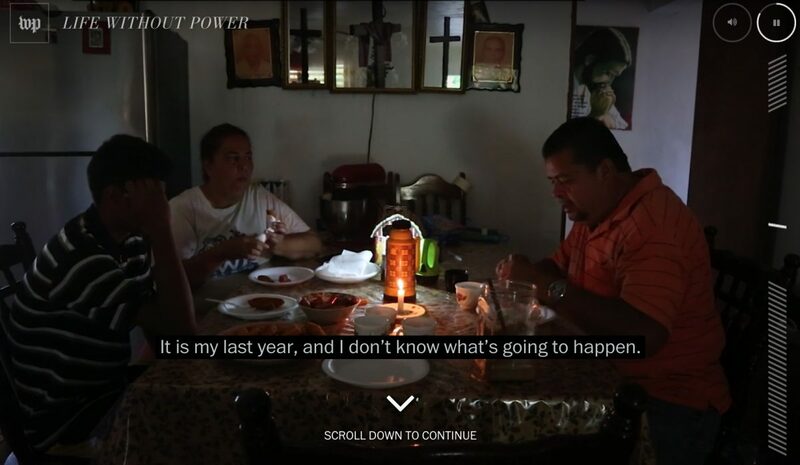 Hernández and Post designers Seth Blanchard, Emily Yount and Armand Emamdjomeh spoke to Storybench about the harsh reality Puerto Rico is facing and how their presentation allows viewers to immerse themselves visually and mentally in the disaster. The first obstacle for Hernández and videographers Leaming and Murphy came as they tried to travel to the island – Leaming and Murphy were able to secure spots on military transports through the National Guard, while Hernández flew commercially from Orlando. Blanchard visited the island later to shoot drone photography that the design team would use to reconstruct major landmarks in the community. A fellow Post reporter had traveled to the island and secured a hotel suite, where the trio stayed for a portion of their journey before bouncing between Airbnb homes and other hotels. They were also able to borrow a rental car, in which they traveled meticulously-planned routes that featured calculated stops at gas stations. The reporters often spent full days without communicating with editors due to a lack of Wifi or cellphone service, opting to update those on the mainland at the end of the day. The idea for the story to zero in on daily life without electricity came from this initial three-week journey. 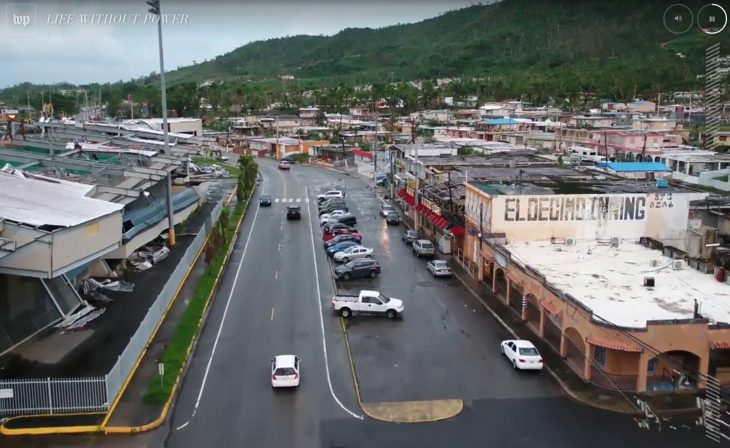 Hernández knew the mayor of Yabucoa and hoped to use this connection to foster relationships within the community, but ended up connecting with many of her sources by accident. 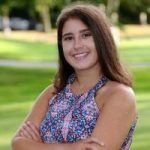 She met Alondra Quiles Ortiz and her mother Elizabeth while visiting the public school and convinced the Rivera family to participate after visiting their street food stand for lunch. Once everyone had returned to the mainland in early November, the team began working together through rounds of editing to evolve a text-based outline into a thematic, visual work – a process that Hernández said took about four weeks. Members of the design team agreed that this fluid, back-and-forth process was necessary. [perfectpullquote align=”right” cite=”” link=”” color=”” class=”” size=””]“You have to trust people and the skills that they bring to the table”[/perfectpullquote] The Washington Post had worked in this full-screen, multi-discipline format before, reporting on border walls around the world last October (a project covered by Storybench here). The Sin Luz team used a base code from that project and adapted it to include visuals from Puerto Rico – recorded interviews and b-roll of the devastation – as well as their own 3D maps of the island. The project also featured photogrammetry, which the Post has used once before. Photogrammetry is a process that uses special software to identify the distance between points in photos of objects and use the data to stitch the photos together and add a realistic skin, building a 3-D model. Blanchard and Emamdjomeh used the technique to model a destroyed mountainside, a baseball stadium and a devastated home. While the photogrammetry models could have been made interactive, allowing users to click through the model and experience it on their own, Emamdjomeh said the team opted to play these models in the background of text. The decision was technically easier for the designers, but also served to not distract readers. In an effort to make the project as accessible as possible, the Post translated it into Spanish and made both versions available for free on all major platforms. Hernández said these efforts helped reach two populations central to the story – Puerto Ricans on the island and members of the Puerto Rican diaspora in the mainland United States. The design team believes the way the information was presented heightens the impact it will have on the reader. A simpler format wouldn’t have had the same effect. Collaboration, Yount said, was key to this. “The video team could have produced a couple of videos standalone and Arelis could have written an article or several and that would have been really great work, but it would not have been the same kind of effect that we were able to have by doing it together,” Yount said.